We have completed the transition to our new webpage created by UCLA Recreation. 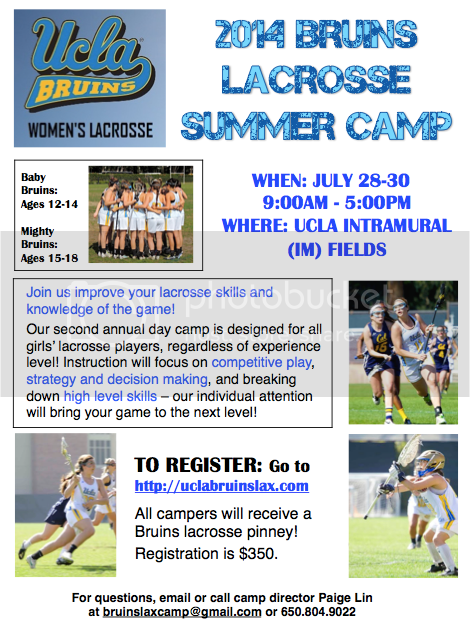 We are hosting our second annual summer camp at UCLA July 28-30, 2014! Don't miss your chance to experience life as a UCLA Bruin! Full registration instructions are available on our new website! After winning their first WWLL Championship since 2003, the 5th seeded Bruins were ready to face national competition May 7-10 in Virginia Beach, VA. First up for the Bruins was 12th seeded Virginia Tech, who received an at-large bid out of the MAWLL. The first half was a back and forth affair, as neither team was able to open up more than a two goal lead. At the half, the Bruins held a narrow 8-7 lead over the Hokies. But the Bruins quickly stretched their lead to four goals, scoring 3 consecutive times to begin the second half. The Bruin defense, anchored by senior goalkeeper Martine Ehrlich, tightened up to only allowing 3 goals in the second half. The Bruin attackers continued to pressure the Hokie defense, scoring 7 goals led by midfielders Gretchen Kiep and Sam Fletcher, with 3 goals each. Kiep finished the game with a team high 4 points (3 G, 1 A). Junior captain Molly Tracy paced the Bruins with her consistent play in the midfield, contributing 4 draw controls and 4 ground balls. On day 2, UCLA was pitted against #4 Georgia in the quarterfinals for a chance to advance to the final four. The Bruins dominated the first half, jumping out to a 4-1 lead in the first ten minutes of the contest. By halftime, the lead was 7-3, but the Bruins knew that no lead was safe. The Bulldogs rallied back, knotting the game at 8 with 7:46 remaining, as the Bruin attack had a difficult time maintaining possession and converting on shots. Winning the draw control has been one of UCLA's strengths all season and it showed when it mattered most, as the Bruins won the last three crucial draw controls. With additional possessions came opportunities to take the lead for good. Freshman Annie Zwaschka scored the game winning goal with 4:49 left off of a feed from Gretchen Kiep. The Bruins won the ensuing draw control and maintained possession for the remainder of the game and denied the Bulldogs the opportunity to tie the score again. UCLA was led offensively by the efforts of Kristin Alexander (3 G) and Kiep (1 G, 2 A). Fletcher continued to be a strong presence in the midfield with 3 draw controls and 3 ground balls. Ehrlich again had a solid effort in cage with 10 saves on the day, denying several Bulldog free position attempts. The Bruins faced #1 seed University of Pittsburgh in the national semifinal game the following day. Despite being unable to convert on numerous opportunities to score in the first half after shooting 25%, the Bruins only trailed Pitt 5-4 at the half. For the first time all year, UCLA was unable to control the draw consistently, winning just 3 of 10 draws in the first half. Ehrlich had a stellar first half in the cage, coming up with 7 saves, 3 off of free positions, to keep the Bruins in the game. However, the Panthers came out of halftime rallying for 5 straight goals to ultimately put the game out of reach. Turnovers and poor shooting plagued the Bruins, as they fell 11-7 to Pitt, the eventual national champions. Despite being denied the opportunity to win the national championship, UCLA found itself in another tight game fighting for 3rd place against #3 Ohio State. Unlike the defensive games played the previous two days, the Bruins entered into a offensive showdown with the Buckeyes. Trailing 5-1 just ten minutes into the game, the Bruins fought back to take a slight 11-10 advantage into halftime. But the Buckeyes responded to take a 16-13 lead, as UCLA was held scoreless for 12 minutes. High pressure defense and relentless hustle allowed the Bruins to slowly chip away at the lead and eventually tie the score at 16 with just 1:10 left in the game. Ehrlich came up with a game-saving stop, running in from out of the crease to deny a Buckeye shot on the empty cage. Freshman Cambrey Knapp picked up a critical groundball and transitioned the ball into the attacking end for the Bruins. Kiep scored the game winning goal, her 9th of the contest, with just 12 seconds remaining to secure the win and third place finish. Kiep capped off a strong week of play with 12 points (9 G, 3 A) to lead the Bruins. Draw controls were once again central to the Bruins' success, as they won 9 of 11 draws in the second half, including the last 8 in a row. Fletcher dominated at the draw circle winning 8 draw controls to go along with 4 ground balls. UCLA finishes their season with an overall 18-3 record and a 3rd place finish at the National Championship, where they went 3-1. As a league, all three qualifying teams from the WWLL, finished in the top 8, with Santa Clara taking 6th and UCSB finishing 7th. Congrats to the Bruins on a fantastic season in 2014! Be sure to check out our new website for the most up to date news. UCLA Recreation has created a new website for its club sports teams. Please use the link below to access our new webpage! We will be transitioning to this new site in the next few weeks. 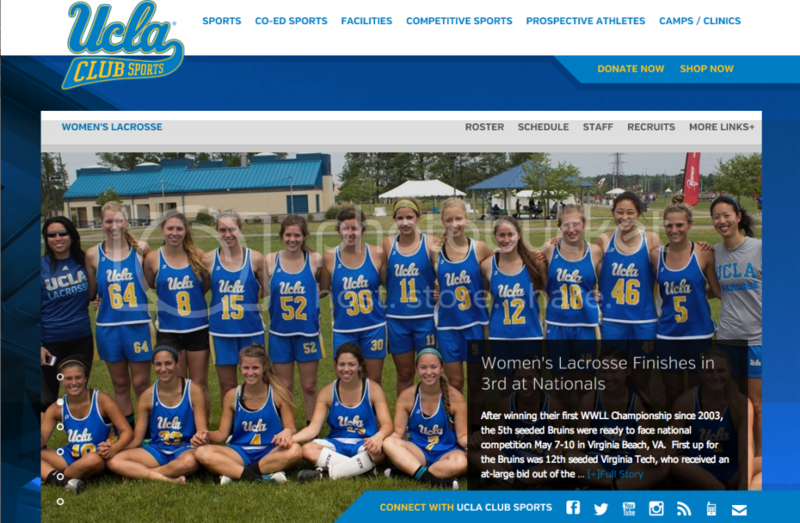 The UCLA Bruins are seeded 5th out of 16 teams as they prepare for the Women's Collegiate Lacrosse Associates (WCLA) National Tournament in Virginia Beach, VA from May 7-10. The Bruins will face #12 Virginia Tech in the first round game on Wednesday May 7th. Thank you for those who have supported and followed us on our journey thus far! Although we have brought the WWLL Championship back to Westwood, we aren't done yet! Flying twenty athletes from our home base to Virginia, booking housing arrangements, and paying tournament fees is expensive...Please help us go all the way by donating to our team's Nationals fund! Any amount helps and is greatly appreciated! Help get us there and we will take care of the rest. Go Bruins! Full tournament bracket and schedule can be found at the USL website. Access our fundraising page here - donations of any size help and will be put directly towards costs associated with Nationals. Ranked 5th in the nation, UCLA was the second seed behind Santa Clara (6th in the nation) for the WWLL Championship Tournament in Santa Barbara, CA. In the first round, the Bruins faced a rematch against UC Davis whom they beat in the season opener 8-7 in overtime. Despite a slow start putting the Bruins in a 3-0 deficit to open the game, UCLA responded to open up a 8-5 lead at the half. A balanced and patient Bruin attack kept the Aggies from ever mounting a comeback, prevailing with a 14-8 victory to move to the semifinal game. Another rematch was set to take place in the semifinal game, as UCLA faced UCSB, who beat SDSU in their opening game 13-12. In the first ten minutes of the game, the Bruins dictated the pace and flow of the game, resulting in a 6-1 lead. After a Gaucho timeout, UCSB narrowed the gap to 9-5 at the half. In the second half, the Bruins continued to attack and exploit the Gaucho defense, but were unable to convert on numerous shots as the ball kept hitting the goal pipe. UCLA withstood any comeback attempt by the Gauchos by controlling the draw and making disciplined decisions to pull out a 14-11 win. The Bruins met #1 seed Santa Clara in the WWLL Championship game for the first time this season. As expected, the contest was competitive as both teams fought back and forth to create any sort of narrow margin. Despite not scoring a goal for 15 minutes of the first half, the Bruins were able to close out the half tied 6-6 with the Broncos. After trading two goals a piece, UCLA snuck a shot past the Santa Clara goalie for a 9-8 lead with 12:39 remaining. Weathering several Bronco attemps to tie the score, the Bruins held on to top Santa Clara and win the WWLL Championship. 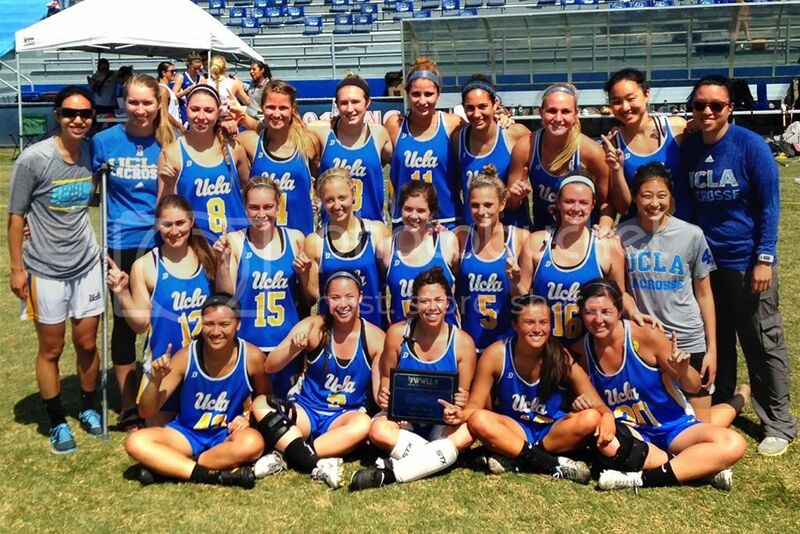 UCLA received an automatic bid to WCLA Nationals in Virginia Beach, VA May 6-10 for winning the WWLL Championship. The Bruins await seeding and the release of the entire tournament field tomorrow night. The UCLA 'B' squad defeated UC Davis 'B' to take home 3rd place from Championship weekend, after a tough overtime loss to UCSB 'B' on Saturday. Congratulations to all Bruins who were recognized at the league award ceremony on Saturday for their accomplishments throughout the year! Ranked 6th nationally for the sixth consecutive week, UCLA entered the final game of the 2014 regular season against unranked USC. The celebration started early for the Bruins as they jumped out to a 5-0 lead against the Trojans just ten minutes into the contest. At the half, UCLA held a commanding 14-3 lead. In the second half, the Bruins tried to slow the game down and work their possessions, taking only 5 shots and making 3, finishing the game with a 17-8 win. The game was the final home game for the seniors - attacker Kate Armstrong, defenders Teryn Bence and Sharon Woo, and goalkeeper Martine Ehrlich. Armstrong scored for the first time this year, after being limited for most of the season due to injury. Bence was a force in defensive and transition play, aiding the Bruins clear throughout the game. Ehrlich picked up 4 saves on the day, but did not see much activity in the contest as the Bruins held the ball for the majority of play. Woo did not play because she is not registered in spring quarter classes. Congratulations to all the seniors on their fantastic lacrosse careers at UCLA! Though last weekend was tough for the Bruins on the draw, UCLA was back to dominating the center circle, winning 82.6% of draws. Midfielder Sam Fletcher once again was a force at center, winning 15 of 18 draws taken (83.3%) and nabbing 5 draw controls. Midfielder Gretchen Kiep led all scorers with 7 points (6 G, 1 A), while attacker Chloe Silance tallied 5 assists. Midfielders Kristin Alexander (3 G, 3 DC) and Annie Zwaschka (2 G, 2 A, 2 DC) also made significant contributions. The Bruins finish the regular season with a 12-2 record overall and 8-1 in the WWLL. UCLA awaits seeding for the WWLL Championship Tournament next weekend in Santa Barbara, where they are a likely top 2 or 3 seed. Although the 'B' team was off this weekend, they will also be traveling to Santa Barbara for the 'B' Division playoff. Though it must still be confirmed, UCLA 'B' should be the 2 seed in the tournament and will play Saturday and Sunday. Full seeding and game schedule will be released by Monday.